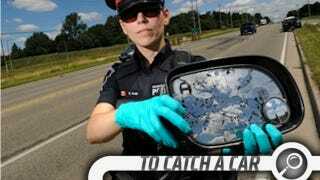 You see that passenger-door mirror in Waterloo (Ontario) Regional Police Constable Rita Spitzig's hands? That's the only evidence authorities have in trying to solve a hit-and-run which left a 60-year-0ld bicyclist hospitalized with non-life-threatening injuries yesterday. It's a common mirror housing for a family of General Motors minivans: Pontiac Montana, Chevrolet Venture and Oldsmobile Silhouette, model years 1997 to 2009. It was also used on Chevrolet Uplander vans, model years 2006 to 2009. For these reasons, tipster Ross H. emailed from Waterloo figuring this was a case on which Jalopnik readers should weigh in. So, any ideas that would enable Spitzig to narrow down the makes/models she's looking for?